This blended family is a model of cooperation, with author Heather Haddon embracing her husband’s new wife and kids as part of her family as well. We are the Haddons. Collectively and as one unit. Mike and I separated in 2007 and subsequently divorced. We have two great kids, Emily and Carter. Mike married Marge and she has three lovely kids, Robin, Simon and Colin. From the beginning six years ago, the goal for all of us has been to create a family life that is in the best interest of our children. All of them. It hasn’t always been easy, but nothing worth doing usually is. We have two homes that are five minutes from one another, a cat at one house, two dogs at the other. 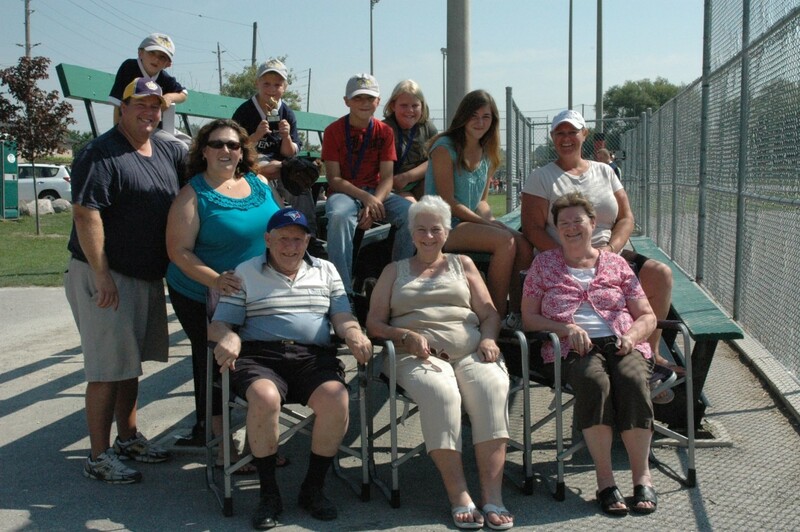 We have grandparents from all over that are supportive and involved in our children’s lives. We spend major holidays together, all of us. We have family dinners and drop in to each other’s houses weekly and unannounced. Our children play softball together and the three of us have coached and been involved with running the league. The picture above has become an annual tradition at the end of ball season as we are all together with the grandparents cheering on the kids. Finances have never been an issue for us. Mike and I took the high road and spent $445 on our divorce, and that was filing fees at the court. We each paid half. We discussed needs and ability to pay and, against the advice of everyone in our lives, ignored the schedules and worked it out together. We are all further ahead because of it. The three of us bring different things to the lives of these kids and they are getting terrific lessons from each and all of us in how to communicate, be compassionate and loving of differences. We really do work as a team and that both raises eyebrows and brings praise from folks in our little town. We now have one living on her own with her boyfriend (she works for me and is finishing school), one in high school, one in grade eight and two in grade five. Each of them have very different personalities; we encourage this diversity and it brings both entertainment and head shakes at our family gatherings. There is no cookie-cutter anything about our family. As the single self-employed woman in the group, I make an effort to be supportive of the marriage and to help create alone time for them. My kids go back and forth one week at a time—although as they have grown older that has become less fixed and more dependent on what’s going on in any given week. Marge’s kids spend time with me often as well, and I enjoy taking the four younger ones away three or four times a year camping or to a night away at the water park. My schedule is not 9 to 5 so I’m available to pick up, drop off, drive to work, shuttle to appointments etc. It’s quite a sight to see the group of us marching into the school on parent teacher night! We all play a role in the lives of these kids and there are no exclusions. The message we try to spread is that it’s not crowded on the high road. Our family is healthier and happier because we compromise and make the effort. Sometimes it means giving but just as often it means receiving. We are the Haddons, and we wouldn’t have it any other way! This is #1000families post number 180. Do you have a family story of your own to contribute to the 1,000 Families Project? Or do you know a family that might want to do so? Learn more about how the series got started and how to get involved here. You can find all of the #1000families posts here. I’ve had the pleasure of meeting Heather and Marge on the softball fields here in Bradford. I thought they were just friends at first – I had no idea about the amazing and almost unbelievable true story about their unconventional blended family…until it was softball playoffs and the whole family was there taking photos. I couldn’t understand why Mike was taking photos with Heather AND Marge! Lol. They are amazing role models for their own children as well as for the kids they coach in minor softball. Thank you for sharing your story, Haddon family!